The Bank of Canada met this morning for the last time in 2011 to make their interest rate announcement. As was widely expected the bank left the prime rate unchanged at 3.00%. If you have a variable rate mortgage or a line of credit your monthly payment won’t change. The bank reported that conditions in global financial markets have deteriorated as the sovereign debt crisis in Europe has deepened. The recession in Europe is now expected to be more pronounced than the Bank had anticipated. Closer to home, recent economic indicators in Canada suggest that growth in the second half of this year is slightly stronger than the Bank projected. Although the crisis in Europe has effected bond prices, which are driving the yield down (typically a trigger for lower fixed rate mortgages), I am not certain that banks will be willing to pass on those prices to borrowers and I feel that fixed rate mortgages will remain unchanged and stable into the new year. Son Of A Broker’s Pick Of The Week: The fixed 4 year at 2.99% offers you the lowest rate for the longest term and is the best bang for your buck today. Fill out a quick online application and I’ll be in touch shortly to set you up with a 120 day ratehold for 2.99%. The following is a graph I sourced from my good friends at Ratehub.ca which shows the recent convergence of fixed and variable rate mortgages. 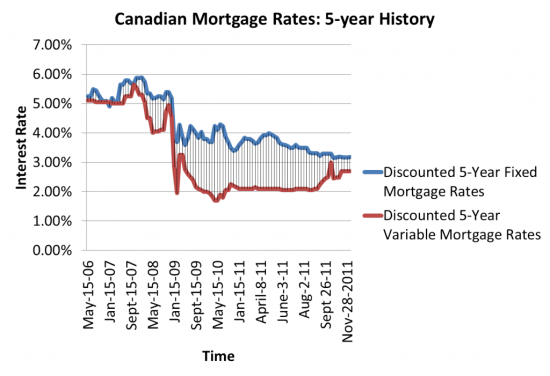 Starting late August 2011 it’s clear to see the upwards trend of variable rate mortgages converging with a relatively flat fixed rate market.